After Anatevka Archives - Joelle Delbourgo Associates, Inc.
Alexandra “Al” Silber seems to have everything: brilliance, beauty, and talent in spades. But when her beloved father dies after a decade-long battle with cancer when she is just a teenager, it feels like the end of everything. Lost in grief, Al and her mother hardly know where to begin with the rest of their lives. Into this grieving house burst Al’s three friends from theatre camp, determined to help out as only drama students know how―and they’re moving in for the duration. Over the course of that winter, the now five-strong household will do battle with everything Death can throw at them―meddling relatives, merciless bureaucracy, soul-sapping sadness, the endless Tupperware. They will learn (almost) everything about love and will eventually return to the world, altered in different ways by their time in a home by a river. Told with raw passion, candor and wit, White Hot Grief Parade (Pegasus, July 2018) is an ode to the restorative power of family and friendship―and the unbreakable bond, even in death, between father and daughter. 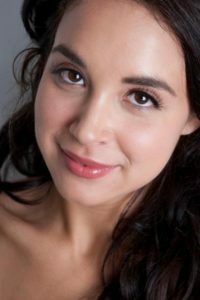 Alexandra Silber is an actress and singer who starred most recently as Guenevere in the Shakespeare Theatre Company production of Camelot and Tzeitel in the Broadway revival of Fiddler on the Roof. She earlier played Hodel in the same show in London’s West End. Those two roles inspired her to write After Anatevka. Her other Broadway, New York, and West End credits include Master Class, Arlington (Outer Critics Circle nomination), Carousel (TMA Award and Ovation Nomination), Kiss Me Kate, and Hello, Again (Drama League nomination). She received a Grammy nomination for her portrayal of Maria in the recording of West Side Story with the San Francisco Symphony. She has appeared on all three incarnations of “Law & Order” and has performed in a variety of concert outlets including the 57th Grammy Awards, Royal Albert Hall, and Carnegie Hall. She lives in New York City. 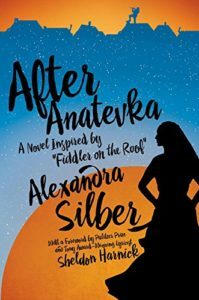 In After Anatevka, Alexandra Silber picks up where Fiddler left off. Second-eldest daughter Hodel takes center stage as she attempts to join her Socialist-leaning fiancé Perchik to the outer reaches of a Siberian work camp. But before Hodel and Perchik can finally be together, they both face extraordinary hurdles and adversaries―both personal and political―attempting to keep them apart at all costs. A love story set against a backdrop of some of the greatest violence in European history, After Anatevaka (Pegasus, July 2017) is a stunning conclusion to a tale that has gripped audiences around the globe for decades. Alexandra Silber is an actress and singer who starred most recently as Tzeitel in the Broadway revival of Fiddler on the Roof. She earlier played Hodel in the same show in London’s West End. Those two roles inspired her to write After Anatevka. Her other Broadway, New York, and West End credits include Master Class, Arlington (Outer Critics Circle nomination), Carousel (TMA Award and Ovation Nomination), Kiss Me Kate, and Hello, Again (Drama League nomination). She received a Grammy nomination for her portrayal of Maria in the recording of West Side Story with the San Francisco Symphony. She has appeared on all three incarnations of “Law & Order” and has performed in a variety of concert outlets including the 57th Grammy Awards, Royal Albert Hall, and Carnegie Hall. She lives in New York. This is her first book. Sheldon Harnick is the Pulitzer Prize and Tony Award-winning lyricist who co-wrote Fiddler on the Roof. 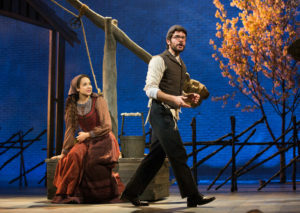 An evocative sequel to the beloved Broadway musical, Fiddler on the Roof that imagines the plight of Hodel as she searches for her fiance in a Siberian labor camp, by the actor who has played Tzeitel and Hodel respectively on the stage in New York and London. 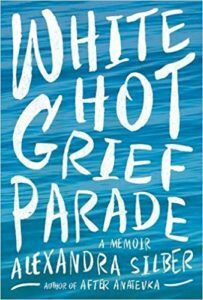 The publisher has also bought White Hot Grief Parade, a remarkable memoir about Silber’s loss of her father to cancer at age eighteen. (World Rights/Pegasus/Spring 2017 for Anatevka and 2018 for the memoir).